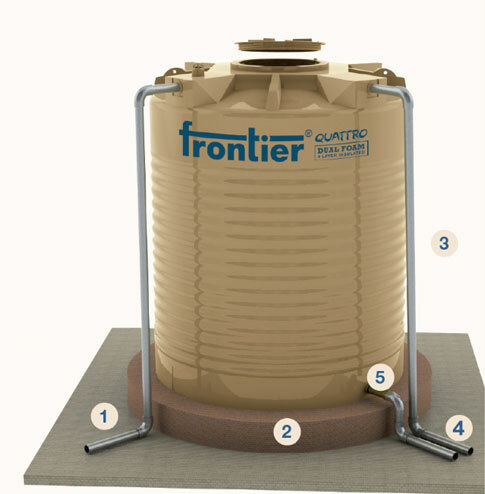 Frontier water tanks are made from LLDPE (Linear Low Density Polyethylene). The industrial water storage tank resin used high ESCR (Environmental Stress Crack Resistance). 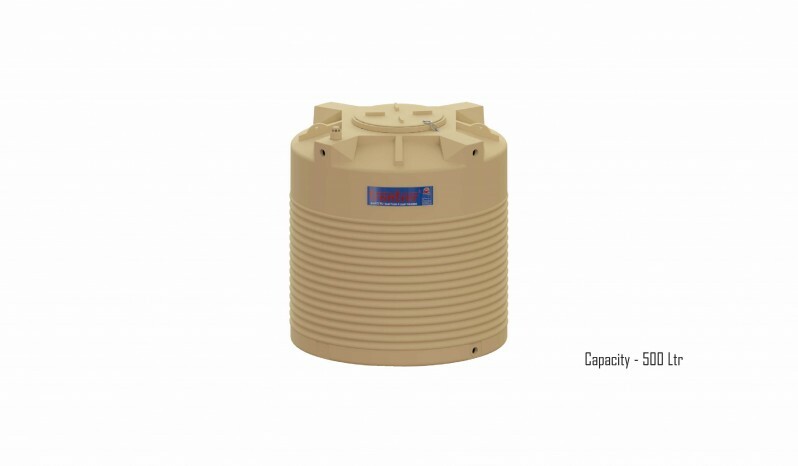 ESCR enables the tank to have maximum possible life. We are manufacturing 4 layers UV stabilized water storage tank. 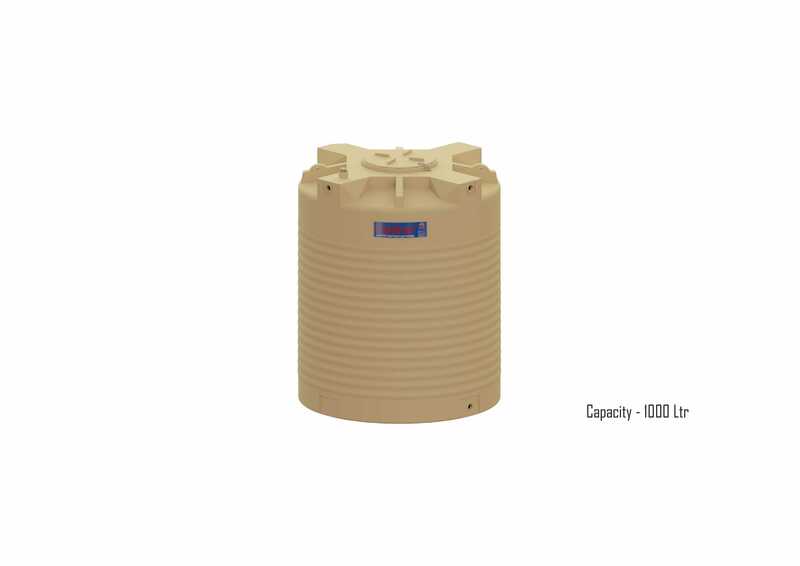 UV stabilization prevents degradation and ensures that there is no cracking, chalking or loss in physical properties of tank. Inner layer is made from 100% virgin Food grade material which ensures that the water does not get contaminated when in contact with the tank & is completely safe for drinking water. 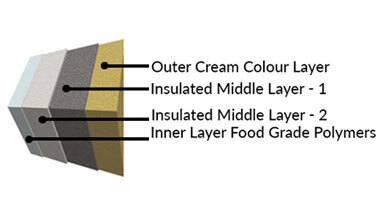 Middle layer is insulation which reduces the heating of the water, maintaining a difference of 20 degrees in compare to black tanks. Outer layer is premier white colour so best water tank in home. Its airtight screwable lid keeps dirt & flies out of the tank. 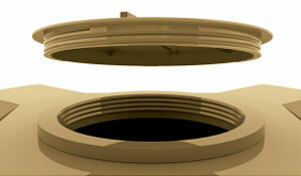 The lid design uses screws rather hinge ensuring air-tight closure. Security rings are provided to put a lock for extra security against theft & improper use. Lids are safer during heavy wind due to its screw able design. 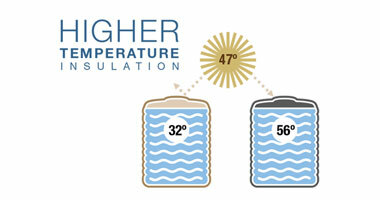 Insulation layers reduce the heating of water, maintaining a difference of nearly 25-30 degree C. The insulation ensures that lesser energy is utilized for cooling. rings are provided to put a lock for extra security against theft and improper use. Meshed Ventilators have been built into the design that allow the water to breath and stay fresh. 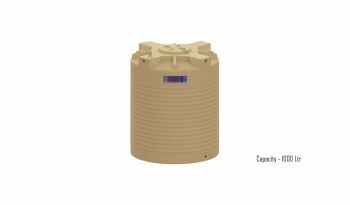 Food grade plastic ensures that the water does not get contaminated when in contact with the tank. Multi outlet options along with inlet and over-flow configurations for better ease of connections. Built in provision for lifting tanks to higher floors. 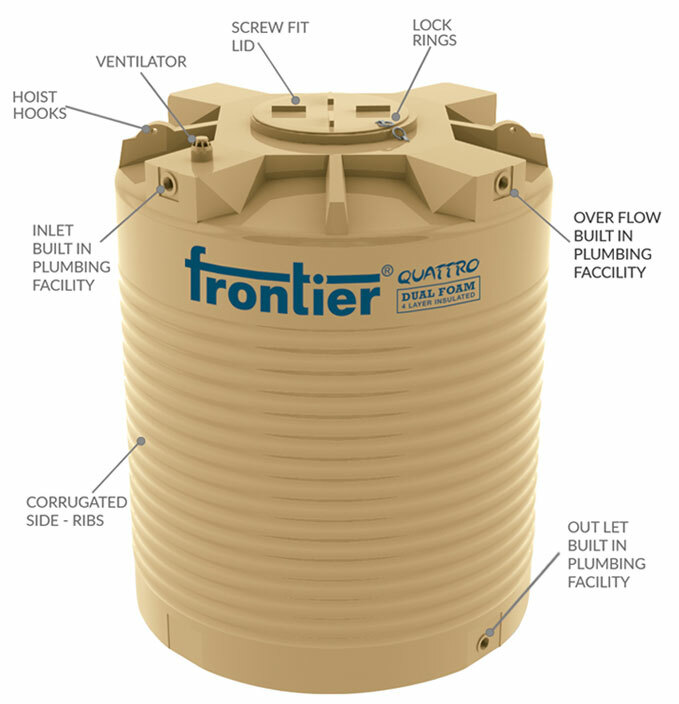 Frontier® insulated tanks have multiple layers of polymer engineered for saving energy, ensuring hygiene and weather resistance. 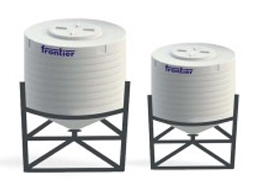 Frontier® Quattro tanks have 4 layers for higher performance. 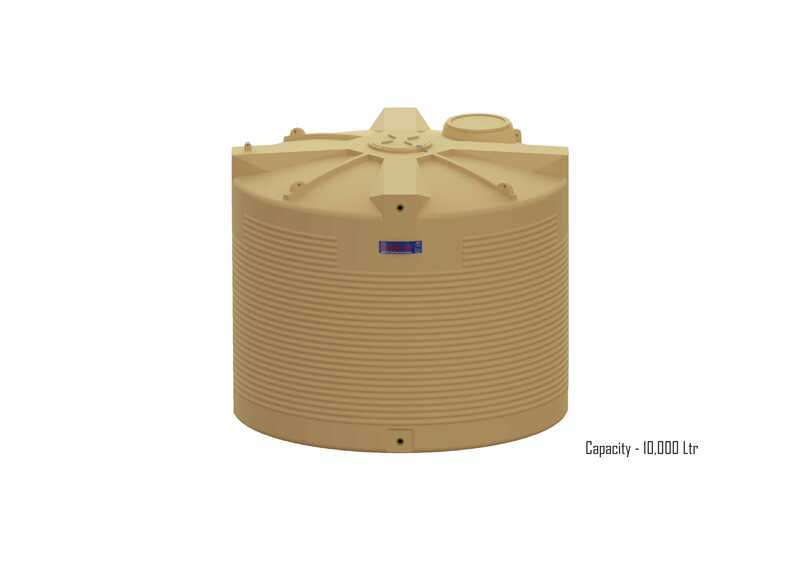 Frontier® water storage tanks do not heat up the water like the ordinary black tanks. 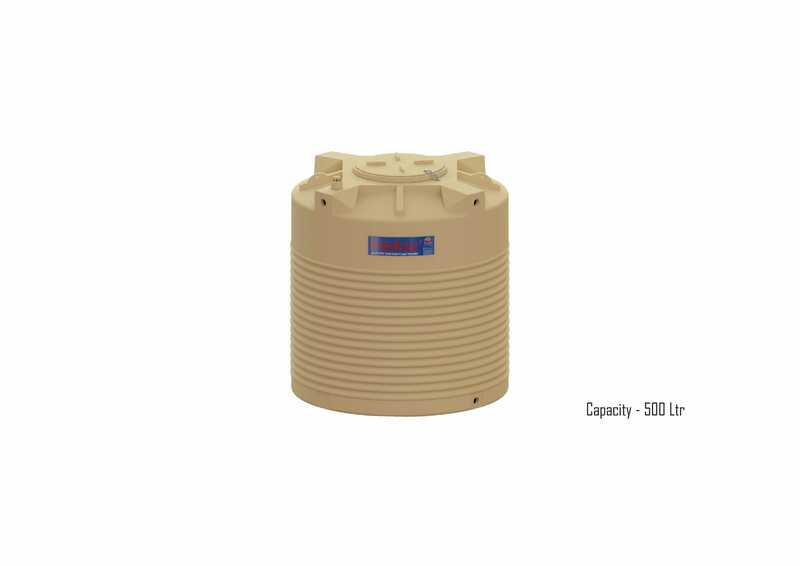 The temperature difference between Quattro tanks and an ordinary tank can reach upto 30ºC. 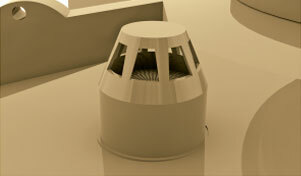 Ventilator with insect-proof screen is provided on every tank to ensure odourless and clean water over long durations. The ventilation allows the water to breath and interact with the outside air. Stainless Steel Mesh are incorporated to keep any dust or flies out. It is essential for the tank to breathe as it will prevent built up of smell in case of prolonged non use. Provision for ease in hoisting to the higher-floor of the building has been built in on every tank top. Overhead tanks require careful handling during installation, especially while hoisting them to the top of the building. Since these tanks are usually placed on higher floors we have an inbuilt provision to ease the lifting process. Multiple plumbing inlet and outlet facilities for better ease of connections are prebuilt into the Quattro tanks. 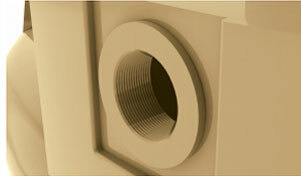 With our `SEAL-IT’ technology, we are able to offer you a wide range of inlet / outlet / overflow options. There in no need for your plumber to drill holes, just put a reducer where required and connect your pipe. 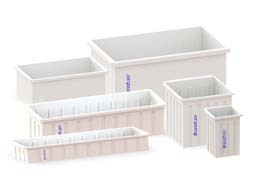 Corrugated side profile are incorporated to build greater strength and ensure structural sturdiness for high volume capacity models. The special ribs around the stomach of the water tank counter the hoop tress that leads to bulging due to water pressure. Strong galvanised plated rings to lock the lid with tank top are provided as an inbuilt feature with our new Quattro tanks. 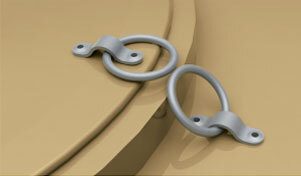 The lock rings provide extra security measure against water theft during scarcity. The facility also provides a safe guard against any unwarranted vandalism. 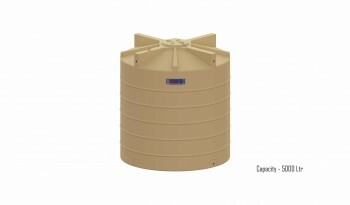 A unique threaded lid ensures longevity of the cover and that the content of the tank are free from dust and flies. Screw fit lids have a better and longer life compared to hinged-lids. They are air tight, and safer during heavy wind. 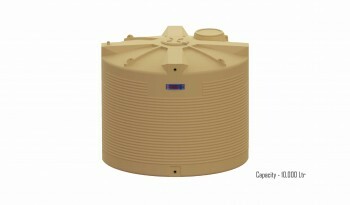 Quattro Dual Foam Water Tanks come in a wide range of shapes and sizes to cater to your specific needs. 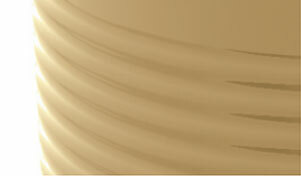 Customized solutions for both domestic and commercial usage are provided. 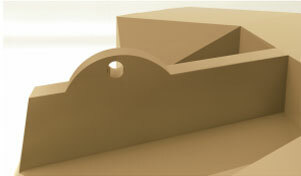 Tank accessories are in-built according to design specified. 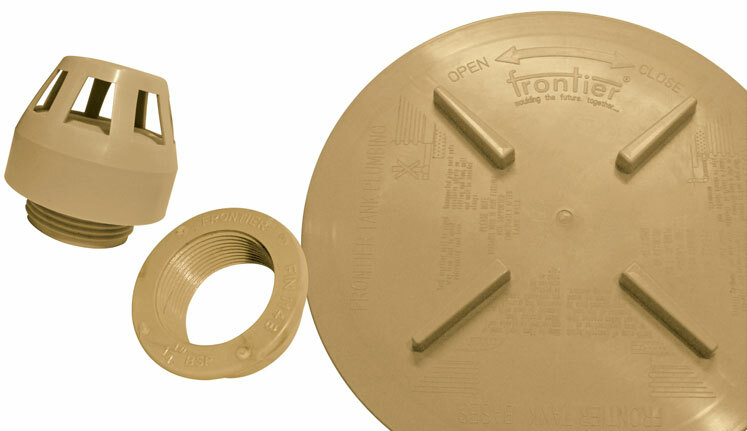 Multi options for inlet, outlet and over-flow for specific configurations can be incorporated. installed on a single tank. The site must be solid, level, compacted base that extends beyond the diameter of the tank. Suitable bases include brick, concrete, gravel with sand top surface between 300mm and 400mm in depth. 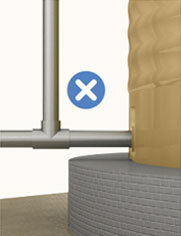 Leave sufficient space between the tank and any surrounding structures to allow for expansion when the tank is filled. We recommend a minimum of 150mm (6 inches) all around. Position the tank ensuring best access for filling, maintenance and safety. 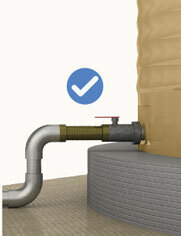 Ensure the tank is protected from strong winds (especially when empty). If necessary strap it down. Connect all pipe work, fittings and accessories once location has been established. All pipe work and fittings connected to the tank should be supported. Water tank stands can be used but must be designed by a qualified consulting engineer. Failure to follow the installation guidelines will render any warranty null and void. Insert a length of flexible pipe to absorb shocks & movements of pipe fittings from tank. 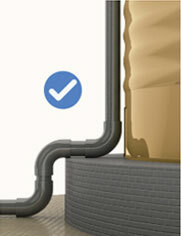 Position the pipe directly on ground to avoid damage caused by standing over pipes. 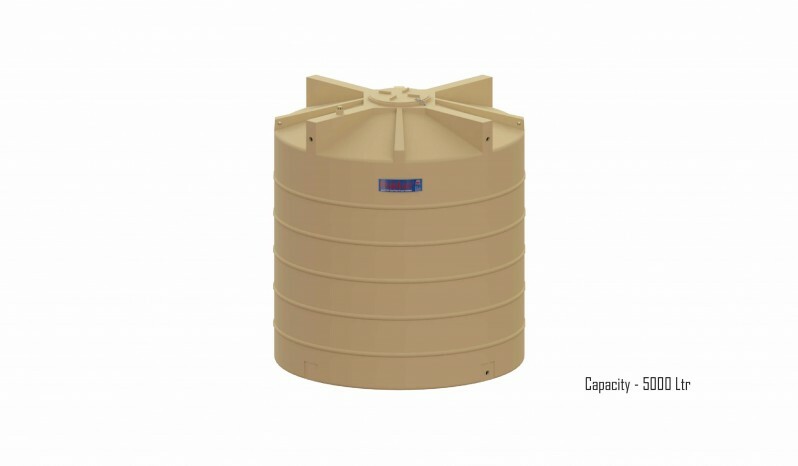 Water storage tanks must not be used for underground installation unless supported by load bearing walls and full underground slab. Move the tank with care, only when it is completely empty & away from any construction material at site. 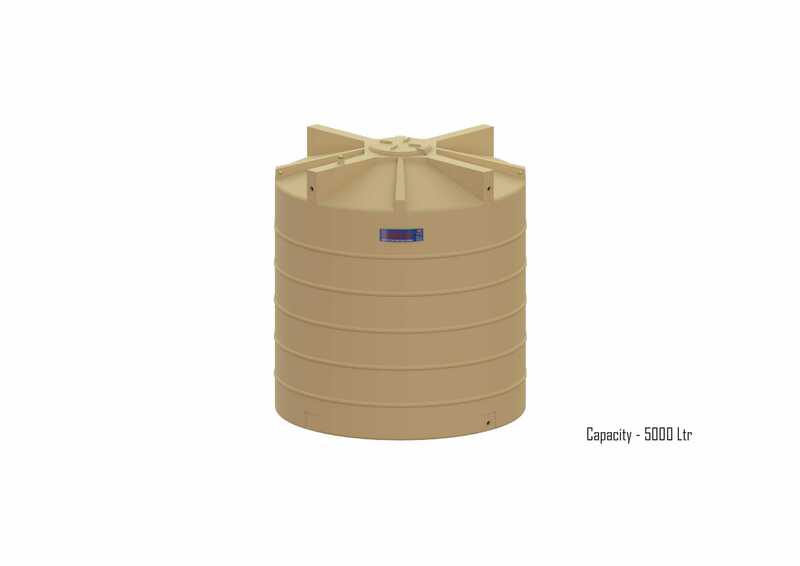 Cylindrical water storage tanks are designed for static applications (not for transport purposes) and are heavy when full. Kindly use only Horizontal design tanks for transport application. Do not climb or stand on the tank (for example, during filling). The outer surface of the tank can be a slip-hazard. The tank structure and integrity of seals could be affected if the pipe-work and fittings are not sufficiently supported. Please refer to instructions on lid /warranty card.